The miniaturization of electronics continues to create unprecedented capabilities in computer and communications applications, enabling handheld wireless devices with tremendous computing performance operating on battery power. This same miniaturization of electronic systems is also creating new opportunities in biotechnology and biophysics. A team of researchers at Columbia Engineering has used miniaturized electronics to measure the activity of individual ion-channel proteins with temporal resolution as fine as one microsecond, producing the fastest recordings of single ion channels ever performed. Ion channels are biomolecules that allow charged atoms to flow in and out of cells, and they are an important work-horse in cell signaling, sensing, and energetics. They are also being explored for nanopore sequencing applications. As the "transistors" of living systems, they are the target of many drugs, and the ability to perform such fast measurements of these proteins will lead to new understanding of their functions. The researchers have designed a custom integrated circuit to perform these measurements, in which an artificial cell membrane and ion channel are attached directly to the surface of the amplifier chip. The results are described in a paper published online May 1, 2013, in Nano Letters. "Scientists have been measuring single ion channels using large rack-mount electronic systems for the last 30 years," says Jacob Rosenstein, the lead author on the paper. Rosenstein was a PhD student in electrical engineering at the School at the time this work was done, and is now an assistant professor at Brown University. 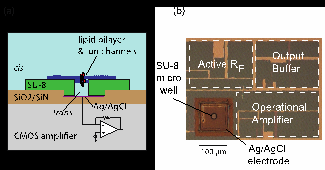 "By designing a custom microelectronic amplifier and tightly integrating the ion channel directly onto the amplifier chip surface, we are able to reduce stray capacitances that get in the way of making fast measurements." "This work builds on other efforts in my laboratory to study the properties of individual molecules using custom electronics designed for this purpose," says Ken Shepard, professor of electrical engineering at the School and Rosenstein's adviser. The Shepard group continues to find ways to speed up these single-molecule measurements. "In some cases," he adds, "we may be able to speed things up to be a million times faster than current techniques." Re: "Ion channels are biomolecules that allow charged atoms to flow in and out of cells, and they are an important work-horse in cell signaling, sensing, and energetics. They are also being explored for nanopore sequencing applications. As the "transistors" of living systems, they are the target of many drugs"
Channels and pumps might exist, but they are probably not maintaining the observed voltage gradients and charge concentration. After all, Gerald Pollack explains very clearly in his book, Cells, Gels and the Engines of Life, that the cytoplasm is a gel, and gels come pre-packaged with voltage gradients and phase transition functionality -- the latter being the transistor functionality which medical researchers seek out. After all, the ion gating pulses of these channels has also been observed within polymers too using the same clamp technique. Isn't it time to take a closer look at this half-century debate? The reward for questioning our models could be a medical revolution.